Workplace Safety Blog | Safetycare | Safety Training Videos | Free Safety Pictures and Resources: Elevating Work Platform (EWP) Shocker! This shows the use of an elevating work platform (EWP) on uneven ground. 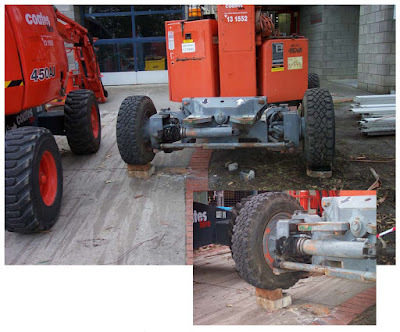 Scissor-lift EWPs must not be operated on uneven ground unless outriggers are used. They definitely should not be chocked as shown. If the surface is uneven, relocate the EWP to flat ground. Use a knuckle-boom lift or review what other height access can be employed. - Ensure all level indicators are in place and fully functional.